There’s a line in the Smiths’ “Unloveable” that goes, “I wear black on the outside/’cause black is how I feel on the inside.” Morrissey, the Smiths’ former lead singer, decided to take his love of that line, as well as an image of James Baldwin, to make T-shirts to sell on his North American tour. Not too many people are feeling this T-shirt, and rightly so. I mean, why superimpose Baldwin’s image onto your own lyrics? Why not just superimpose your own face? Many people have called out the tee for being racist because, well, Morrissey’s racism has been well documented. Reggae, for example, is to me the most racist music in the entire world. It’s an absolute total glorification of black supremacy. ... There is a line when defense of one’s race becomes an attack on another race and, because of black history and oppression, we realise quite clearly that there has to be a very strong defence. But I think it becomes very extreme sometimes. 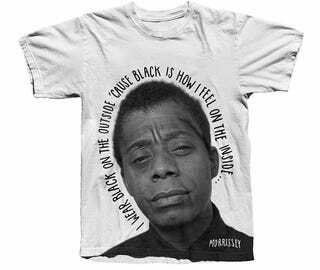 But sure, throw a photo of Baldwin on a T-shirt with your own lyrics and go ahead and make money from it at one of your concerts.